A moment or torque is a turning force. It is measured in Nm. You will get a turning force if an object is fixed at a point it can pivot about. We call the direction that the force is acting in the line of action. A moment will make an object want to turn or topple, we can use another moment on the other side of the pivot to balance it. A good example of this is a seesaw. If you are trying to balance against a heavier person, you will have to increase your moment by moving away from the pivot but if you are balancing a smaller person you much move towards the pivot. 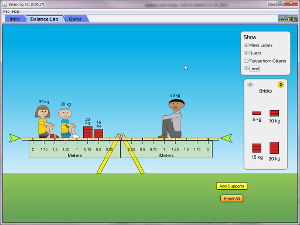 The seesaw will be balanced if the total moment on each side is equal. We define the centre of mass of an object to be the point from which all mass can be considered to act. It is the point where all the moments from it are equal. For a shape of uniform density it will be in the centre of the object. An object will topple if the line of action from the centre of mass falls outside the object. For example, a and b will be fine but c will fall over.